Our custom woven lanyards are tough and durable, and are popular in industrial or outdoor environments. a personalised woven lanyard generally work best with simple block style text or simple logos as the weaving process does not allow very detailed designs to be reproduced. Check out our lanyard advice page if you're unsure of which to choose. Choose up to two colours for your logo or design to be woven into the lanyard. We can weave a repeating design or a single design along the whole length. 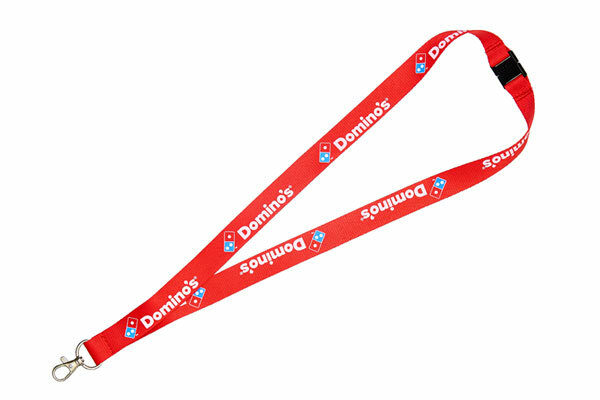 Your logo or design can be repeated along the lanyard, or can span the whole length. Pricing for a single colour embroidery, woven lanyard on 1.5 or 2 centimeter flat polyester ribbon with a metal trigger clip and single safety break. * £8.50 postage applies for up to 14Kg to one "non-remote" UK address. See our delivery FAQs for more information.